This is a photo taken in the Coal Exchange building in Cardiff Bay. This is one of the most important buildings in the history of Cardiff and is testament to the City's rise and fall as a pivotal part of the world economy. 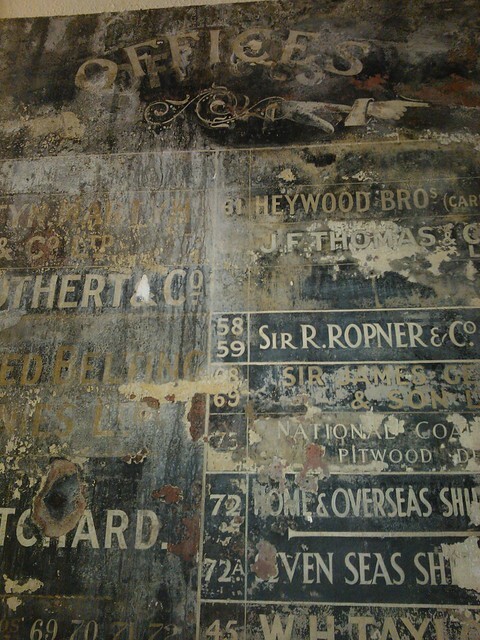 This particular image taken on an upper floor seems to show a signboard highlighting the offices and organisations that would have had space in this part of the exchange building at the height of its activity. Over painted, scuffed, altered, recovered and faded. A beautiful and poignant artefact, displaying the layers of history.